In Defense of Communism: SHAME: Greek soldier punished because he participated in anti-war demonstration! SHAME: Greek soldier punished because he participated in anti-war demonstration! antiwar rally in Athens, 27 February 2018. 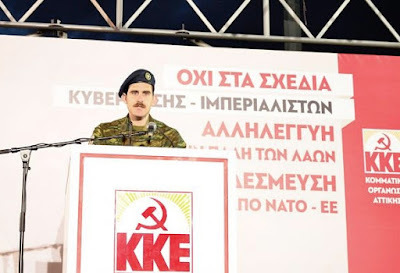 Aimilios Kaklamanos, soldier of the Greek army, was punished by his unit for participating and speaking in an antiimperialist demonstration organised by the KKE in Athens on February 27th. In his speech, the soldier had argued against the participation of Greek soldiers in the warmongering imperialist plans of NATO-EU. "The KKE denounces the unacceptable punishment of the soldier who participated and spoke at the antiwar rally of the KKE, in Athens, on 27/2. He is being persecuted because he highlighted that task of the soldiers is to defend the country's borders and territorial integrity and not to participate in the plans of NATO and EU for the profitability of the business groups. These plans are the ones which threaten with a new intervention on Syria and a generalized imperialist war. The SYRIZA-ANEL government bears huge responsibility for this development. While members of the Golden Dawn are officially invited in events of the Armed Forces, a soldier is punished because he- using this inalienable right- publicly expressed his opposition to the involvement of our country's Armed Forces in plans which have no relation with the interests of the Greek people and the country's defense". The All-Workers Militant Front (PAME) also condemned the punishment of the soldier, calling all Trade Unions and labor associations to denounce this unacceptable decision by the Greek Armed Forces.